The ministry of the Altar Guild is to care for and beautify the church in preparation for worship. 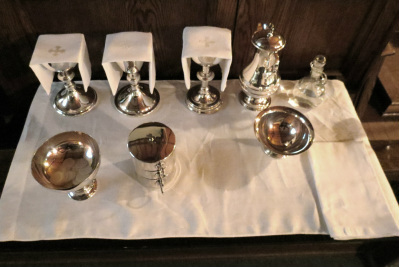 Guild members prepare the sanctuary for all services, including the weekly Eucharist, Baptisms, weddings and funerals. They decorate the church for special occasions such as Easter, Christmas, and Harvest Thanksgiving. The ministry team takes care of linens, vestments, sacred vessels and furnishings. The Altar Guild also arranges flowers given by people in the congregation in memory of a loved one who has died, or as a thanks giving for blessings in their lives. Men, women and young people are welcome to become a part of this vital and blessed ministry. If you are interested and would like more information about the Altar Guild, please contact the church office at 204-489-3390 or by clicking here. Help us so to serve Thee in Thy sanctuaries here, that we may be prepared to serve as those who worship before Thy Throne and see Thy Face hereafter. Through the merits of Jesus Christ, Thy Son, Our Lord, Amen.